Department of Futile Exercises: Summing up the U.K. and the U.S. | Notes from the U.K.
Department of Futile Exercises: Summing up the U.K. and the U.S.
I’ve been hearing about British values since I first came to this country, and I always wonder what they are. Standing in orderly lines? Forming brass bands? Not using sunscreen on the beach, even though you’re light-skinned and have already turned an alarming shade of pink? It’s a heavy responsibility, settling on a handful of characteristics to sum up an entire nation. 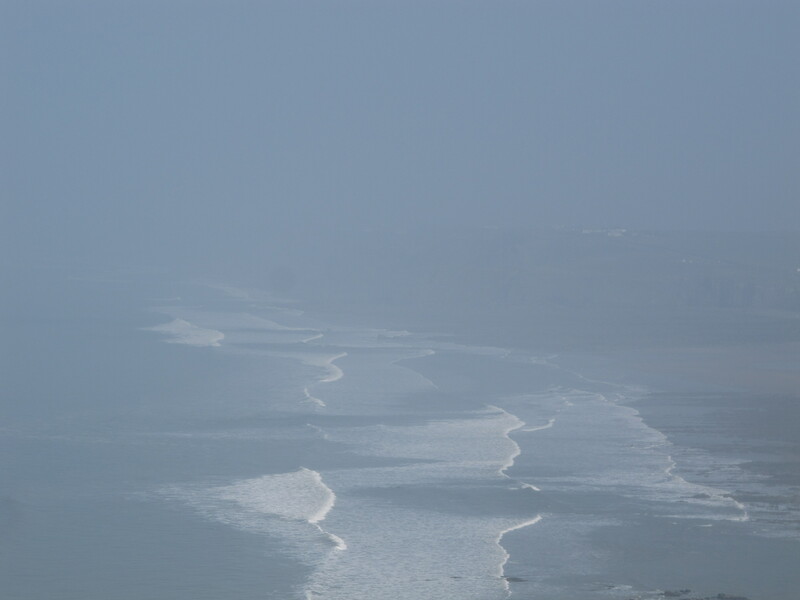 Irrelevant photo: The coast on the same hazy day as the last waves-in-the-haze picture I posted. The haze was caused by a sandstorm in the Sahara. Don’t you just love a politician who can say stuff like that with a straight face? Because, of course, no other country in this battered old world can lay claim to those ideals. If you’re startled awake some night and hear that set of values marching down the street behind a brass band, you’ll know right away what country you woke up in. Any discussion of British values is complicated by a central reality of Britain, which is that the country’s a mash-up of four (or five, if you’re a Cornish nationalist) nations**, and the people most likely to call themselves British seem to be those of us who aren’t English, Scottish, Northern Irish, or Welsh. Or Cornish. In other words, those of us who came from someplace else. Those of us whose children the Department for Education is worried about Britishizing. It wasn’t a question I had an answer for, and as it turned out no one else did either. The class broke into small groups, and a couple of them set about finding some essential trait that would separate the Americans from the non-Americans, but pretty much everything people suggested fell apart. Being born in the country? Nope. You could still become a citizen, and a citizen was an American. Being a citizen, then? Well, legally, yes, but some non-citizens are as culturally American (whatever that means) as any citizen. One small group, pushed, I think, by a single enthusiast, decided that speaking English was a dividing line, but the other groups didn’t jump in to endorse that. Personally, I’m all for speaking the language of a country you live in (British and American expats in non-English-speaking countries, are you taking notes? ), but not every immigrant can learn a new language. My great-grandmother never did, even though the price she paid was not being able to talk freely with her grandchildren. It wasn’t lack of motivation. She wasn’t young when she immigrated and she couldn’t make the adjustment. Maybe she wasn’t good with languages. Maybe she was terrified. I don’t know. No one, including me, thought to mention that other countries speak English and it hasn’t made them particularly American. In fact, some countries—mentioning no names—think they speak it better than we do. And then there are the Puerto Ricans. They’re U.S. citizens by birth. If some of them speak only Spanish, either by choice or because it’s their only language, are they any less American? I won’t go on. We couldn’t say what being American meant, although we all thought we knew. So, British values? Sorry, folks, but I’m not hopeful. I will, however, have a hell of a good time listening to the debate as it staggers on. *My spies tell me it used to be the Department of Education, but the name was changed at some point. I’m sure the education system is better because of it. **I owe the insight about the U.K. being a country of four (or five) nations to my writers group. The United Kingdom looks a whole lot more united from the other side of the Atlantic. In fact, Scotland came very close to leaving in 2014. Somebody tell me: Did that get any coverage in the U.S.? This entry was posted in Intercultural Mayhem and tagged Americans in Britain, Americans in England, anglophile, Britain, British values, Cornwall, England, humor, immigration by Ellen Hawley. Bookmark the permalink. The notion of ‘British Values’ is certainly a bewildering one, I grant you. The phrase jumped into being as a knee-jerk reaction to the discovery of so-called ‘Trojan Horse’ schools in Birmingham, where radicalised Islamic leaders were setting their own academic agenda – separating girls and boys, for example, as well as not teaching ‘male’ subjects such as maths and science to their female students. There was a bit of a panic and the DfE came up with this little sound bite. I am still none the wiser as to what constitutes a British Value, despite being British myself. Not English, you understand, as my father is Scottish. Quite why things have to be so complicated, I shall never quite understand. But I wouldn’t mind betting that tea and cakes come into it somewhere. Tea and cake! How could I have ignored that? That is, surely, goes on the Best of Britishness list. I know the Britishness business went into high gear after the “Trojan Horse” uproar, but I swear I was hearing about it before that, just not as often or as loudly. There is very little that cannot be saved by tea and cake, that’s for sure. You could very well be right. It is a wonder, isn’t it, how we were able to recognise our own values before our delightful polititians got involved! Yes, Scotland’s independence referendum got a lot of coverage here in the US, mostly just because a lot of celebrities weighed in on it. Thanks–I did wonder. Of course it would be about celebrities, not whether a longstanding nation breaks up. Ack! Now I regret leaving that comment, because I feel like I am “broadcasting the stereotype” of Americans. I need to remember to leave smiley face emoticons on all my comments. For the record, I am an American, and I followed the news relating to the Scottish vote, not because I cared what Kim Kardashian thought about the subject, but because I have revolutionary blood coursing through my veins, and I would have rather the Scots run through Parliament lopping off heads with a broadsword while shouting “Freedom!” than be all sensible and vote on the matter. Great image. It may not be the most responsible political act I ever envisaged, but if I spend more than a minute listening to a politician talk I have the same impulse. And I’m pretty sure you were understood even without the emoticon. I think ‘British values’ are about as meaningful and coherent as the kinds of questions non-Brits get asked when looking for residency/citizenship, most actual citizens wouldn’t know the answers so why these are used to test someone’s potential Britishness I’ve no idea. English politicians (and it inevitably is the English ones) are always intend on defining what it means to be British yet always fail in that endeavor. They either end up going down some right-wing, xenophobic path or else they use some wishy-washy stuff that’s actually universal – as this set of values appears to be. I rather think that one of the best things about Britain (and not confined to those shores, of course) is it’s very diversity so why try to make everything homogeneous? Yes, the Scottish Referendum had a surprising degree of coverage here in the US. I tend to still watch BBC news but even the other news broadcasters were covering it in some detail. I met strangers who would hear my accent and discuss it with me, so clearly it was engaging Americans. The majority I spoke to were in favour of Scotland’s independence, probably more because it is in keeping with America’s self-determination and throwing off the yoke of colonial rule than any familiarity with the issues involved, and it was great to be discussing Scottish politics here. I’m with you on the diversity. It makes a culture so much richer. Interesting that Americans were engaged enough with the Scottish referendum to discuss it with you. I’m tempted to say, Trust us Americans to have an opinion on the subject even though we don’t really understand it, but that’s off the top of my head, snotty, and probably unfair. And probably true of a hundred other cultures, while we’re at it. Having an opinion on topics you don’t understand is another quality that isn’t limited to one country. I think they were more interested in the principle of self-determination and the idea of breaking away from colonial rule – themes that loom large in American history – but were rather less knowledgable in regard to the meat of the debate, policies and such. But I liked that so many people were at least interested and gained an understanding that Scotland is a distinct country within Britain. With limited knowledge of British values and way too many snarky comments coming to mind about our own (American) values, I’d have to bring the debate down to tipping. Don’t leave a tip for the housekeeper in England and don’t leave your wallet in your hotel room in America. There you go. Lesson over. And the referendum in Scotland did get a lot of coverage. Perhaps it was a good illustration of a current American value, as it was often depicted as the political equivalent of the end of the world as we know it by TV news commentators more interested in ratings than doing their job of informing. I do tend to watch BBC News here in New England. You could probably do a fair cross-cultural study by following attitudes toward tipping around the world. I don’t know how deep into a culture it’d take us, but it’d be interesting. I thought the referendum on Scotland got quite a bit of coverage, but I could be mistaken. I read a lot of blogs that were fairly fierce on either side of the issue. I think summing up a nation’s values is like writing a horoscope. It has to be sufficiently vague as to apply to any and all, which of course renders it meaningless. I think a nation is defined by its diet. Tea and scones, warm flat beer, fish and chips, roast potatoes and of course spaghetti bog and chicken tikka. You can apply this across the globe I imagine. Whether any discussion on values is meaningful, I’d doubt. As you point out its typically arrogant of us to purloin democracy and a respect for the rule of law to ourselves. Maybe the bizarre Life in the U.K. test should be replaced by a meal. If you can’t eat mushy peas and look happy about it, you’re out. And I would be in so much trouble…. Did you hear the no doubt apocryphal tale of Peter Mandleson, when offered mushy peas said, ‘I love guacamole’. New Labour at its best. I didn’t hear it, but I doubt I’ll forget it now that I have. Great story. Great piece. And yes, I heard a great deal about Scotland’s vote to determine their future. NPR covered the event nicely. I might not have paid as much attention, though, if we hadn’t just vacationed in Scotland, so I don’t know if Americans in general had any interest in the topic. I’m writing this morning from a quiet bedroom in an Air B&B rental in Antigua, Guatemala, so today as I wander about I will try to determine if my American values are worthy of Guatemala. Thanks for the update on coverage of Scotland. Enjoy your visit and your values check. Well, I am the arbiter of good values. American and otherwise. Oh, I’m so glad someone is. It’s a relief, right? No worries, I’ve got this. Definitely. I’ll sleep better tonight. I always enjoy topics like this, because it leads to the inevitable defiance of labels. I had a French pen pal for about ten years, and her idea of America was very Dukes of Hazzard meets Beach Boys meets Jerry Lewis. So for me, living in the heartland, I felt I could never convey HERE. Values? Varied as the day is long. Specific values for a country? Only if governed by a despot. I’m regularly thrown by the assumptions people here make about Americans–who we are and how we live. But they’re no more absurd than the assumptions Americans make about the Brits. I’m sure we could go on listing countries on both sides of the assumption equation. It’s great to have our safe assumptions disrupted. The manners thing–I think you’re onto something there. I’m sure we could all find an exception, but yes, they’re clearly important to the culture. It’s a wonder they put up with me. If you live in enough different parts of the U.S.,you come to realize that there are very few common denominators. You don’t even have to cross state lines to find differences in values, lifestyles, even dialects. We are as different as our geography. What the rest of the world sees as American must come from the media…sigh. You’re right, Van. An amazing amount of things can disappear into a gap like that. Well, if it is going to be about tea and cakes, I’m in! I’m a Brit that the stork accidentally dropped off in California! Oh yes. I have a nice pot of loose leaf black tea with milk nearly every afternoon, enjoyed while listening to Radio 4 (yes, great station with some fascinatingly different programs, i.e., Brain of Britain). However, if Britness requires the consumption of mushy peas, I will have to beg to sub in Cornish pasties (maybe with the peas inside?) or some bubble n’ squeak or just about anything else. The Scotland referendum was well covered here although I mostly listened to Radio 4. I could understand both sides and ended up not sleeping until I heard the results. The current election campaign is distressing and seems quite brutal and personal to me, much like a U.S. election campaign. At least it is only five weeks, not two years. I didn’t know the stork made mistakes like that. That really does rearrange my certainties. The election campaign, though–you’re right, it’s mercifully compressed compared to the American one. And it is getting nasty. Not to mention unpredictable. I did read about Scotland nearly leaving in 2014 but briefly, it was not a lead story. I believe the British youth should be taught about being British, be proud of it and not be taught to be good little citizens of planet Earth. Being American is taking pride in our traditions and trying to vote the most Conservative person possible into the big chair in Washington. Obummer is an obamination. From what I’ve seen, it’s so easy for “I’m proud of my traditions” to slide over into a toxic brew of “My traditions are better than yours.” So although I love it when people are deeply rooted in their traditions (and I hope to write about a really old local one next month), I’m wary of the poisonous turn it can take. As for the most conservative person possible–we’ll just have to disagree there and like each other anyway. Can we do that? I’ve always been extremely conservative but always agree to disagree with others. Gave up politics several years ago. i totally agree that the toxic brew thing happens, and it gets damn ugly fast. Happy to disagree–and even happier to do it in friendship. I am English/British and I am kind of saddened to see British values being leapt on by reeling off a pile of traditions and stereotypes. Traditions are not values. Forming brass bands is not a value. Teaching pale Brits to wear factor 50 on the beach is definitely necessary but not a value. Promoting British values in schools has certainly come somewhere from the small amount of extremism being taught in certain schools in this country. I can sort of see what the Government are trying to do but I can see the other side of it as well. Teachers face such a difficult job and so much red tape and then the Government throw in the active promotion of British Values which to lump it under one umbrella is asking for trouble somewhere. For once, I think the Government mean well especially at the moment where ukip are scarily gaining and gaining support but they’ve overreacted to the Trojan Horse hysteria and gone a tad too far. These, are definitely values (whether you agree with them as good values or not). Where as the majority of 1st generation uk immigrants, even though their parent(s) are not/were not British, they very much consider themselves British. Interesting comment. Thanks so much for writing. I don’t mean the brass band etc. list at all seriously. I offer it only as an indication of how absurd I find it to try to sum up a country–something my class couldn’t do for Americans. I’m comfortable with your list of values, but I think we’d do better if we discussed them as values shared by many countries and cultures rather than specifically British. And we need to acknowledge when and where we–any of the nations who share those ideals–fail to live up to them, otherwise we undermine our own efforts. I’d guess that’s one reason the teachers reported that the effort was causing more problems than it was solving. Since they’re on the front lines of this battle, we’d be wise to listen to them. As for Americans detailing our heritage, again you raise an interesting point. Many of us do that–report ourselves as Jewish-Americans, African-Americans, Italian-Irish-Norwegian-Americans. Hyphenated Americans. In our eyes, we don’t see ourselves any less American for that, it’s simply the kind of American we are. I know you weren’t serious about the brass band etc. I was only quite saddened (i.e a tiny bit!) I just thought as you’ve raised the ‘what are British values” question, it was maybe something worth looking at and discussing properly. When you say you were comfortable with my list of values, I’m not sure if you mean ‘my’ being ”my country”? Just to point out they weren’t mine mine! I cut and pasted them from the gov.uk website. They are the Governments’. I’m completely with you on: it would be lovely to discuss ‘values’ as those shared by many countries and cultures. I think it works to an extent but only to an extent. On the other hand, as a Brit, I do feel I do have personal values that come from being brought up in Britain as opposed to being from the USA. I also appreciate these are not values to every Briton, but in my experience they are to the large majority. I would rather have much less ”freedoms” and know that I can’t spout of religious and racist hatred in public and not be allowed to own a gun. In fact I don’t even see it as an impingement of my ”freedom”. I don’t want these things. I would argue that that is quite (very) a ”British” attitude/value shared by a larger percentage of the British population than the American one considering these are ‘illegal’ here but not in the States. Again I know it’s sweeping statement. I am not religious and I have never encountered any problem growing up here where I have been judged by anybody British for my non religiousness. I have an A level in Christian Theology. Only 3 people out of that class of 20 were religious. We were not judged. I have, however, been given a mouthful by a fair few Americans because I’m not religious. Including one who wouldn’t even mix with me! I’ve been in Westminster Abbey and heard a group of Americans who were so shocked and appalled and just could not fathom why Charles Darwin is buried there. They still weren’t getting it even after someone tried to explain why. It was actually a complete surprise to hear them and has stuck with me ever since. I started out including a section of the post about the government’s stance on intolerance, which I’ve seen summed up as “we won’t tolerate intolerance.” In the end I cut it both because any essay has to have a certain coherence and it just didn’t fit, and also because I try to keep the blog light, and with luck funny, even as I write about serious topics. I resolutely failed to be funny on the subject. It’s a difficult issue, and full of contradictions. I hope to tackle it some day, but I make no promises. I think you’re right about the American attitude toward freedoms. As a culture (and we’re arguing heatedly with ourselves about it, so we’re far from of one mind about this) we haven’t figured out where we draw the line on gun ownership. Shotguns? Automatics? Intercontinental ballistic missiles? Here, my sense is that you see much more freedom in not being surrounded by guns. On our religious differences, I also think you’ve nailed it. In the U.S., I hesitated about telling people I was an atheist because it tends to shock people, so each time I’d have to decide whether I wanted to do that, and whether I wanted to put out the energy to discuss what that means and whether I really do, then, have any morals. Here, it seems to shock no one. Which is interesting, since of the two the U.S. is the country with no established religion and an officially secular public school system. Again, thanks for thoughtful, challenging comments. I appreciate them. As an American living in California I share your attitude and opinions. I am very seriously worried about the U.S. heading off in a very intolerant but well-armed direction. I see evidence of this everywhere. I was a teacher (mostly 12 & 13-year old students) and I was just beginning to see parents interfere in the teaching of history and cultures when I retired 12 years ago. I was accused of trying to turn students into Muslims which is really ridiculous. I feel sorry for anyone trying to educate kids in that part of California now. I moved as quickly as I could to the coast which is really like a different state than inland California. We Americans seem to have lost our sense of community and genuine caring for anyone outside of our own circle. I’m trying to figure out exactly what has happened over the last 50 years. Of course, there are some obvious things: TV, cable TV, the Internet, 9/11, Fox News and more but I think our choice of response to all this and more has been very damaging. I just finished a book by Gail Collins about the history of women over the last 60 or so years in the US which gave me some perspective but, so far, Jeff Sharlet’s The Family has provided the closest thing to an explanation. I am so alarmed that I have tried to talk my sons into moving elsewhere and my family has been here since the 1640s. Oh well. That’s enough seriousness here on Ellen’s blog where I come to learn and laugh. Last night I got a reply from her just as I was getting ready for bed (and when you are starting your day) that made me laugh so hard I could not consider sleep until I read some more of James Naughtie’s complicated but sleep-inducing first novel. More interesting and thoughtful comments. Thanks. And thanks for letting me know I kept you up. Another good day’s work accomplished. Pingback: Summing up English culture | Notes from the U.K. Brilliant article. Perhaps we should resolve this by copying the Swiss, who do not attempt to summarise Swissness in a snappy mission statement, but instead have planned out a complete exam syllabus which hopeful immigrants must pass before they can get Swiss citizenship? I am told it includes good knowledge of at least one official Swiss language, Swiss history, some rules about how to behave in public and interact with Swiss people without annoying them (queueing is no doubt involved), an understanding of the Swiss democratic constitution and taxation rules and an awareness of Switzerland’s economic role in the global economy and how to support it. The UK does, actually, have a test immigrants have to pass in order to get indefinite leave to remain. See https://notesfromtheuk.com/category/in-the-beginning/. (Sorry to quote myself, but I did take the test….) It’s not on what you’d call practical information. Or even, in large part, sane information. Many British-born citizens acknowledge that they couldn’t pass it. Helping immigrants acculturate and understand where they’ve landed would be great–I can get excited about that–but this test, sadly, is a solid step away from that. As I understand it, the U.S. citizenship test is about the constitution, how government works–stuff that it might actually make sense to ask an immigrant (or, while we’re at it, any citizen) to learn. What particularly pisses me off about the U.K. test is that they ask you to learn reams of stuff that won’t be on the test. Why make it a barrier instead of–excuse the phrase–a learning experience? Yes indeed. I wonder what team of jobsworths devised it? Hard to say. Cynically, I’ve assumed that it was a deliberate decision, coming from hostility to immigrants, to ask people to study more than they’d need to know, but I have nothing but my cynicism to back up my argument. The study booklet itself reminds me of American kids’ history textbooks–stuffed with bits and pieces of facts to placate every possible pressure group. You can just picture someone saying, “We haven’t mentioned Nevada yet,” and someone rushes to put in a mention of Nevada. It leaves the textbooks (or at least the ones inflicted on me when I was a kid–and I loved history outside of class) with no coherence and no story, so they’re hard to learn anything from. Yes, that’s it. I taught history to junior high kids and the textbooks were always a mishmash with absolutely no flow to them and they are inflicted on the teachers as well as the students. We went from a small text with big writing to a big fat text with beautiful reproductions of paintings, tiny writing and college-level language on very busy pages. The first was really boring and insulting to the kids’ intelligence while the second needed to be read in class with me jumping around the room, using the walls and the overhead to interpret and illustrate–exhausting but somewhat fun. Together we wrestled meaning out of that giant book. It was so big that we had to have a set in the classroom so the students didn’t have to lug them back and forth every day (and you can imagine how that would NOT happen!). Nevada–best mentioned in an environmental studies class as providing many examples of what not to do. You could start with that strange place that the English seem to love, Lost Wages. I had to change planes there in March and looking down on the place made me wonder why anyone would want to see the canals of Venice or I.M. Pei’s pyramid in the middle of a desert–all context lost! I would say the Sierras were spectacular but they belong there. When I was a kid, I used to think it was just me who couldn’t draw any sense out of the history texts. Even now, it does me good to hear that it was the textbooks. As for Nevada, apologies to anyone who knows and loves the place. I’ve never been there, which is probably why it popped into my head as the place the textbook committee would have forgotten to mention. From my Scottish grandmother who was born in London: “If I’d been born in a stable, it wouldn’t have made me a horse.” She died convinced they were two separate countries, in reality if not in name. I think I’d have liked your grandmother.